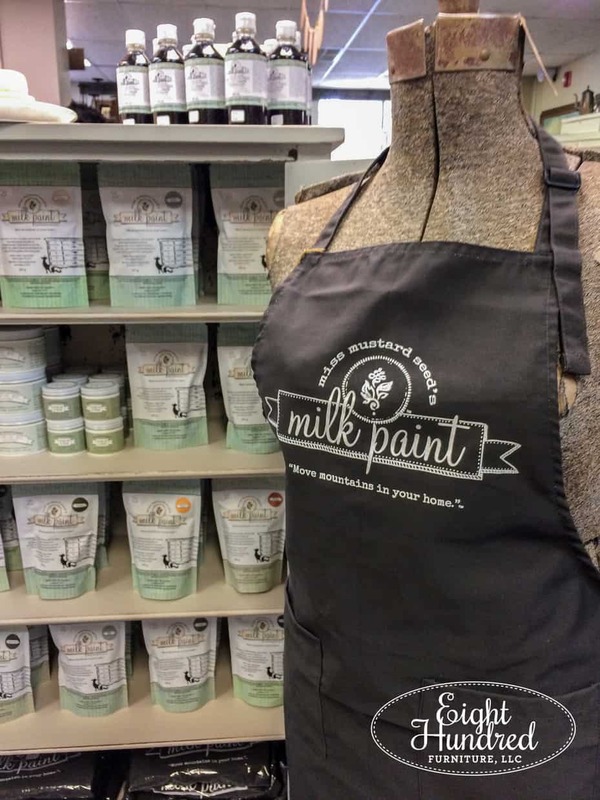 This weekend, I had the pleasure of running a “Paint Your Own Piece” Milk Paint Workshop at Morgantown Market. 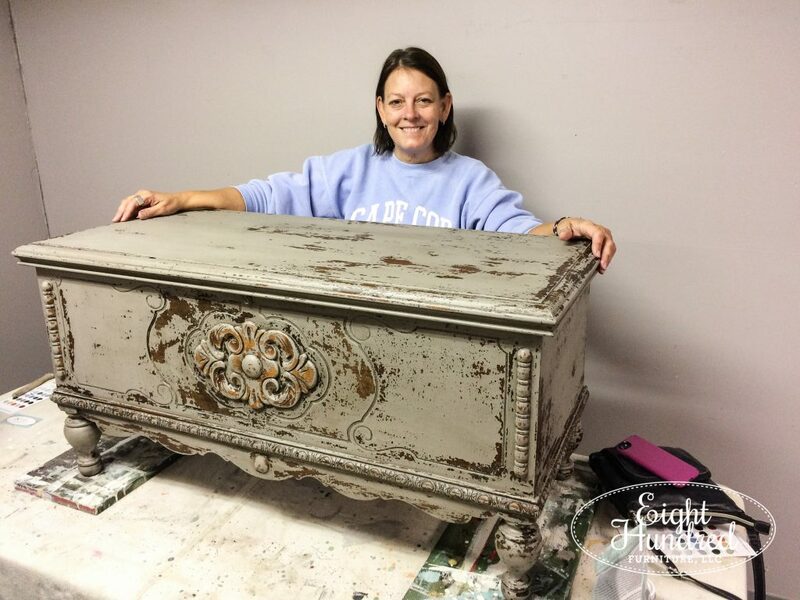 These workshops are always a fun time because participants get to bring an outdated piece from home and transform it under my guidance into something fabulous using Miss Mustard Seed’s Milk Paint! 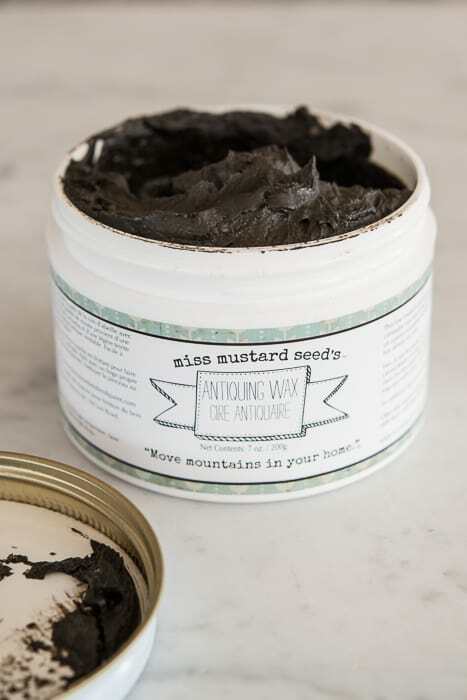 For around $100, I provide everything you need – sandpaper, paint, tools, wax, etc. – and you get to go home with a brand new piece of furniture. Pretty good deal, eh? I thought I’d take some time and share how things went during this round! This piece belonged to Jamie. It was her husband’s grandmother’s and it has a marble top that sits in the cutout circle. 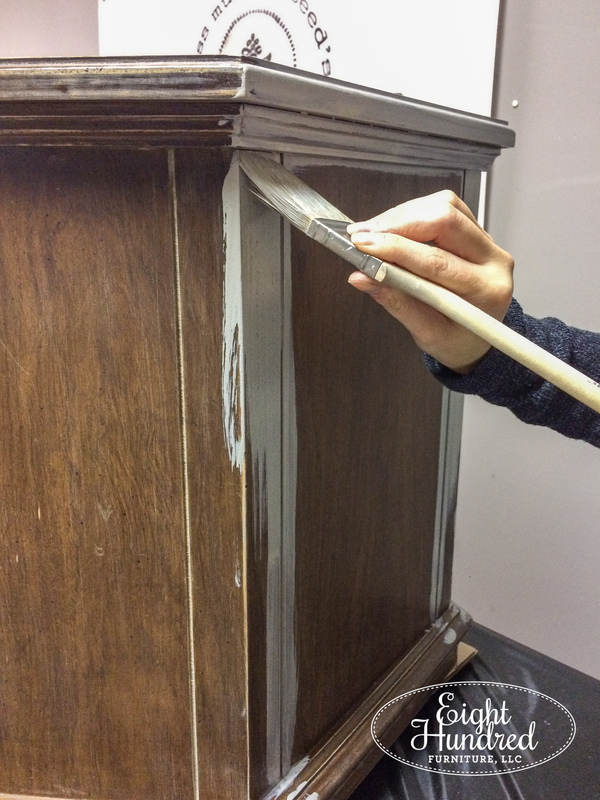 Jamie scuffed it with sandpaper prior to bringing it to the workshop because it was relatively smooth and glossy. Jamie loves all things clean and modern. 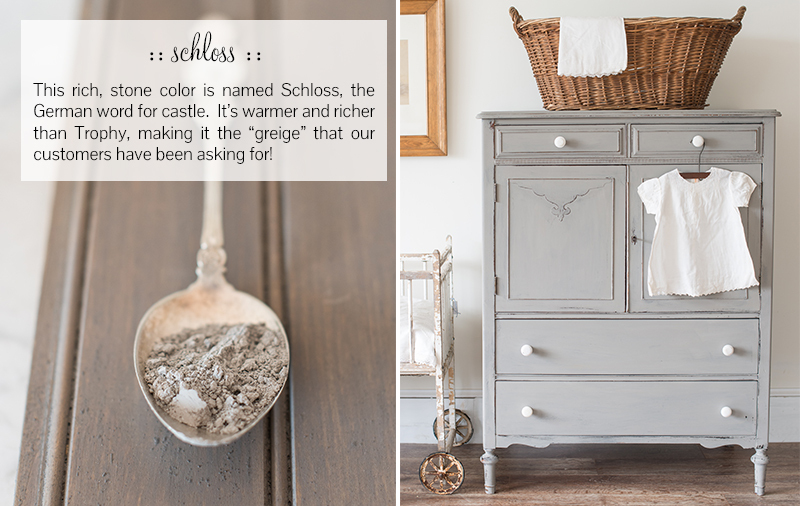 She fell in love with November’s Color of the Month, Schloss. Her decor at home was a mixture of warm and cool, so we thought she might enjoy the warmness that Schloss brings. I advised Jamie to mix up a batch of Schloss with some Bonding Agent squirted in. 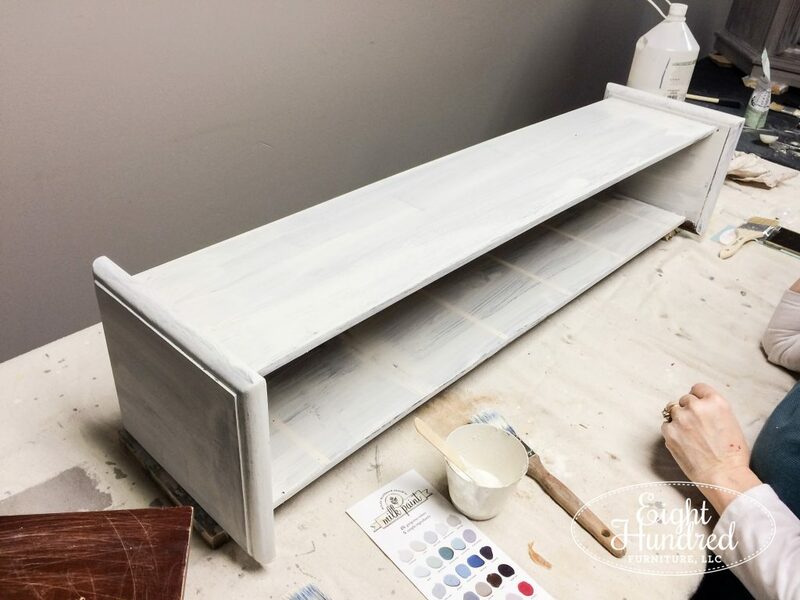 Jamie didn’t want any chipping on her side table, so Bonding Agent ensured that Milk Paint would stick without chipping and give her the smooth modern look she wanted! Watching Jamie paint was so much fun! 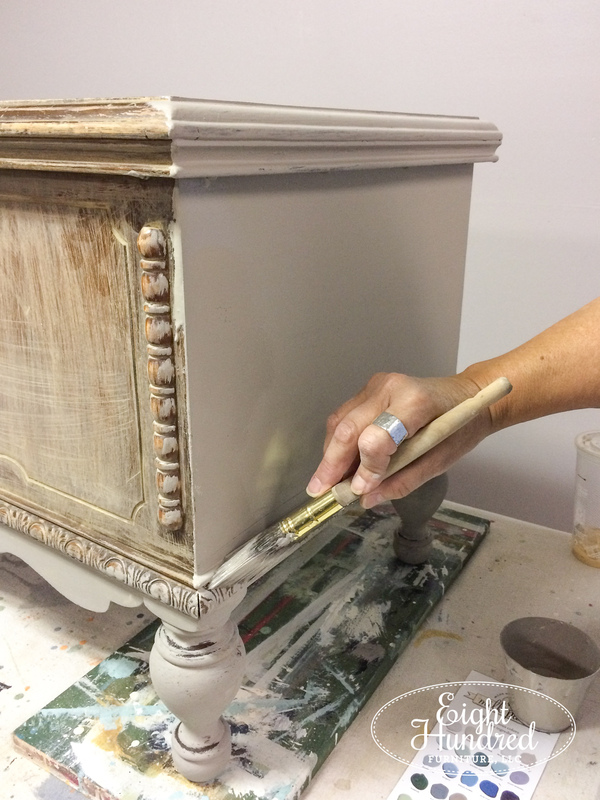 She was careful to watch for drips and she did an amazing job getting a super smooth finish. As she applied her White Wax, it nestled into the grain of her piece like a champ, giving her the soft touch she was looking for. Jamie was my last painter to finish, and her efforts totally paid off because her piece looked amazing when she was done! 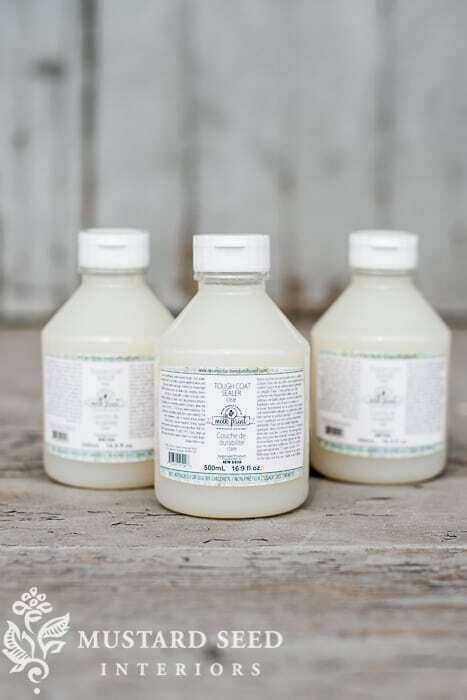 Can’t you picture how beautiful this would be with a marble top? 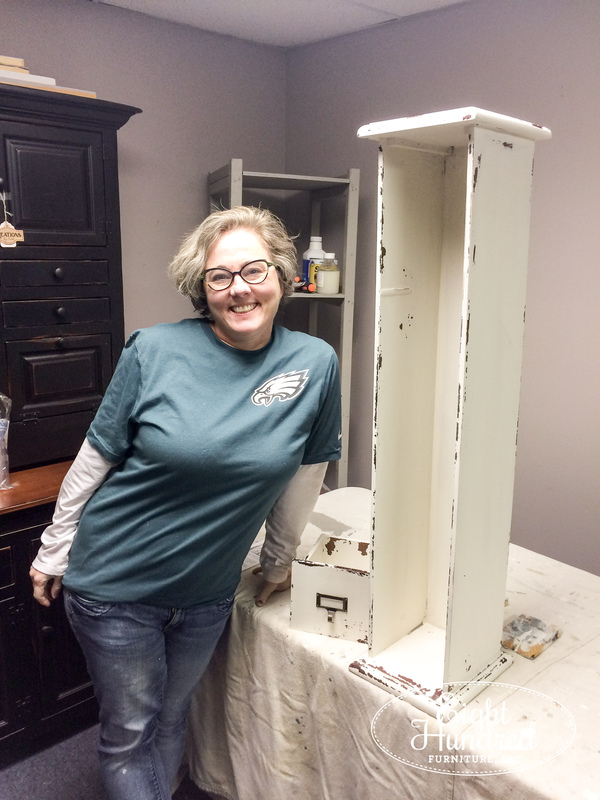 Kitty is one of my fellow vendors at Morgantown Market and she had an old CD storage piece that she wanted to repurpose. Her thought was to remove the runners from the sides, remove the drawers, and use it in a powder room to hold toilet paper. What a GREAT idea, right?! She also brought along one of the drawers to hold a box of tissues. It had the sweetest card catalog hardware on it. 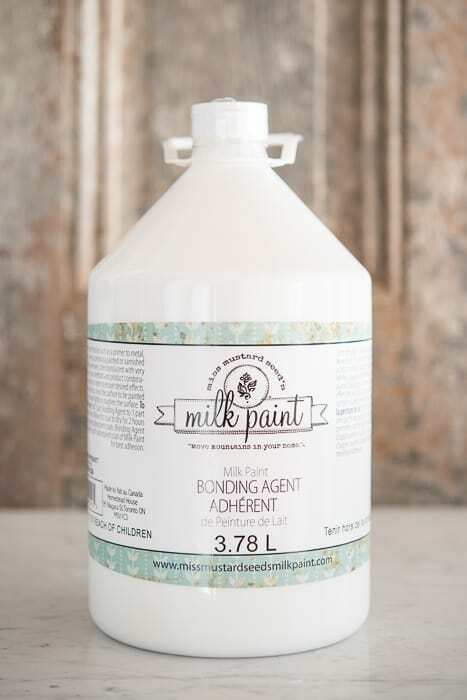 Kitty was fearless when it came to jumping into Milk Paint. 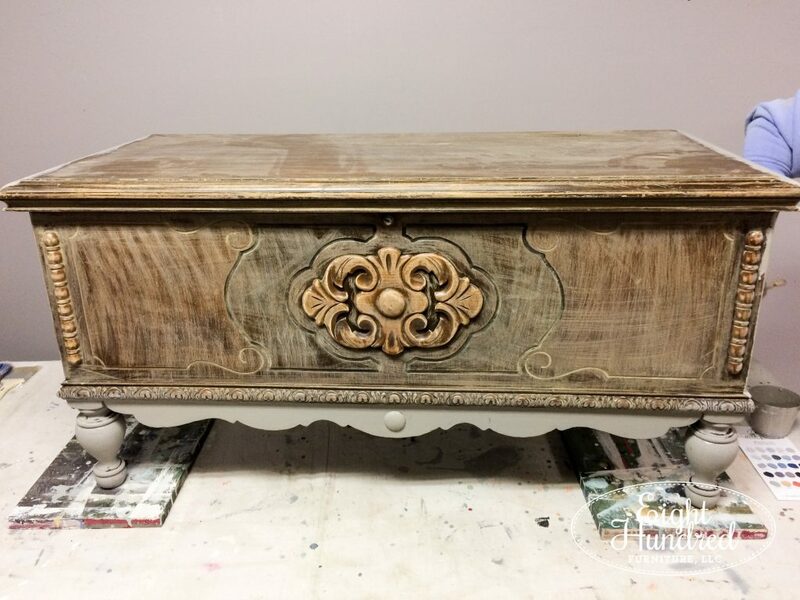 She was open to chipping and she wanted a fresh white finish so we decided on Farmhouse White for her piece. 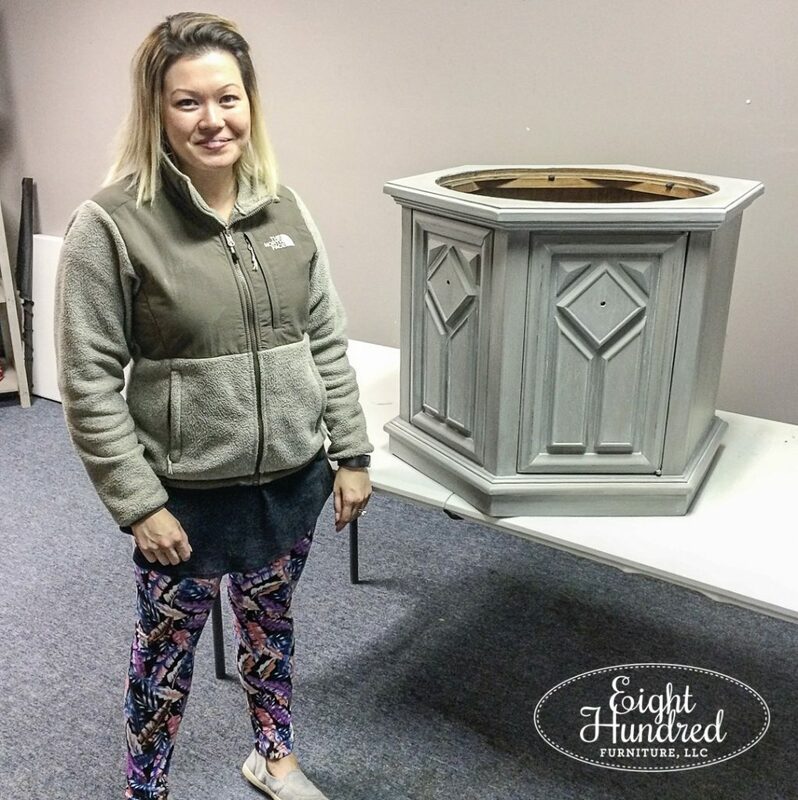 Kitty’s piece had a factory finish on it with a dark stain, so we scuffed her piece outside with 100 grit sandpaper. It took three coats of white to cover her piece completely. 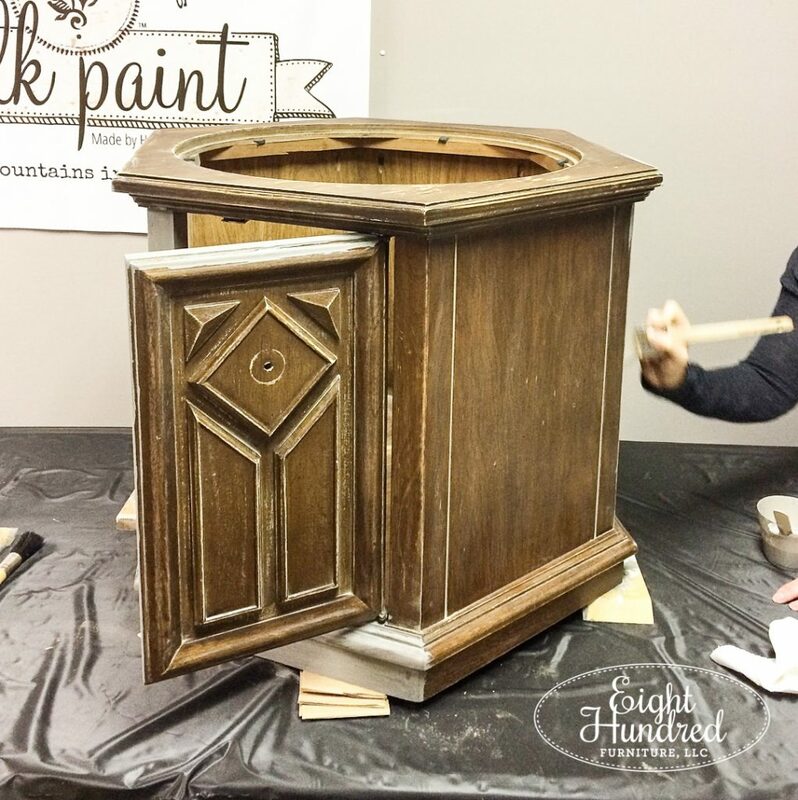 Here’s a shot of the first coat going on. I was so proud of Kitty for diving right in! Her piece chipped in all the right ways, and she got to experience the magic of Tough Coat. 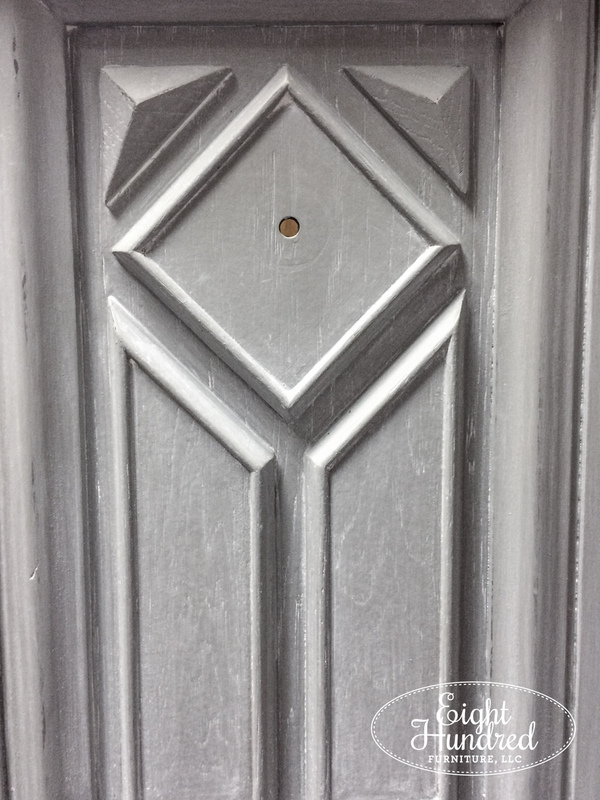 It does an amazing job at sealing in chipping paint, and it’s an ideal finish to use in a bathroom environment. 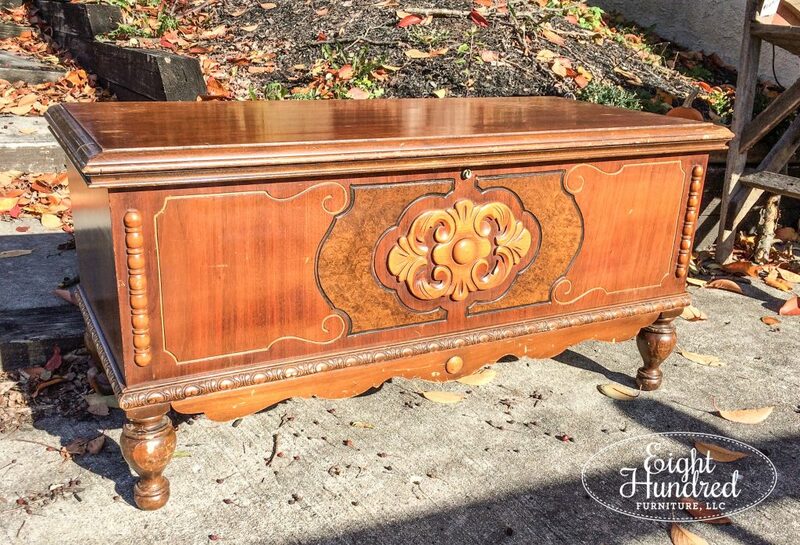 Lisa brought a small cedar chest that she bought online. It had the yummiest carved details and the sweetest turned legs. As you can see, Lisa’s chest had a shiny and glossy finish on it. We scuffed it with 100 grit sandpaper, just like Kitty’s piece. I helped her tackle that part to save her some time. Lisa also fell in love with Schloss, and she was open to chipping. She mixed up 1/4 cup of paint and began painting it on. The transformation was immediate! Can you see how we scuffed her piece? 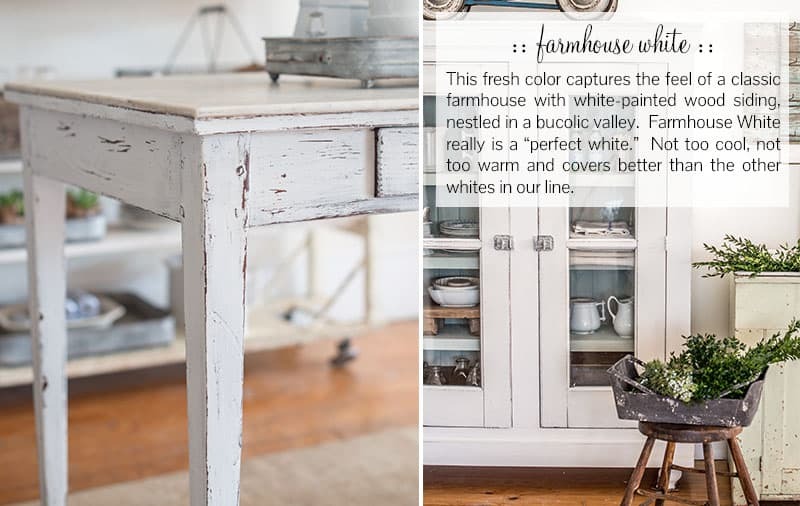 We didn’t take it down to the raw wood, but we scuffed it up enough to give the surface some “tooth” so Milk Paint would stick to it. Lisa was so excited to be taking a class because she works a job during the second shift. She has a huge heart and an even bigger eye for diamonds in the rough! Lisa dove in whole-heartedly and you could see her wheels spinning as she dreamed up more projects to tackle. Lisa finished her piece with some Hemp Oil and Antiquing Wax. She was so happy with how her chest turned out and she said it looked like it had been in someone’s attic for years. Before I started painting furniture for a living, I was a middle school science teacher. I have 10 years of educational experience and these workshops give me the chance to tap into that skill set. While the girls were painting, I was in my happy teaching place so it was a win-win! If you’re interested in joining me for the next “Paint Your Own Piece” workshop, you can check the “Upcoming Events” section of my website and register at Morgantown Market to reserve your spot. I try to limit the class size to 3 or 4 participants so everyone gets lots of one-on-one attention. So when I offer these workshops, you should jump on board because they fill up quickly! Hopefully you’re inspired to tackle a project of your own!